North Yungas Road in Bolivia has been given the menacing title of ‘World’s Most Dangerous Road.’ The stretch of 60-plus kilometer highway, connecting the capital city of La Paz to Bolivia’s Amazon Rainforest, is estimated to kill between 200-300 travelers each year. Now, the Sip Advisor likes his occasional doses of danger, but this seems a little too treacherous. Buckle up tightly, cause here we go! Bolivians refer to the road as El Camino de la Muerte, which translated means ‘Road of Death’. 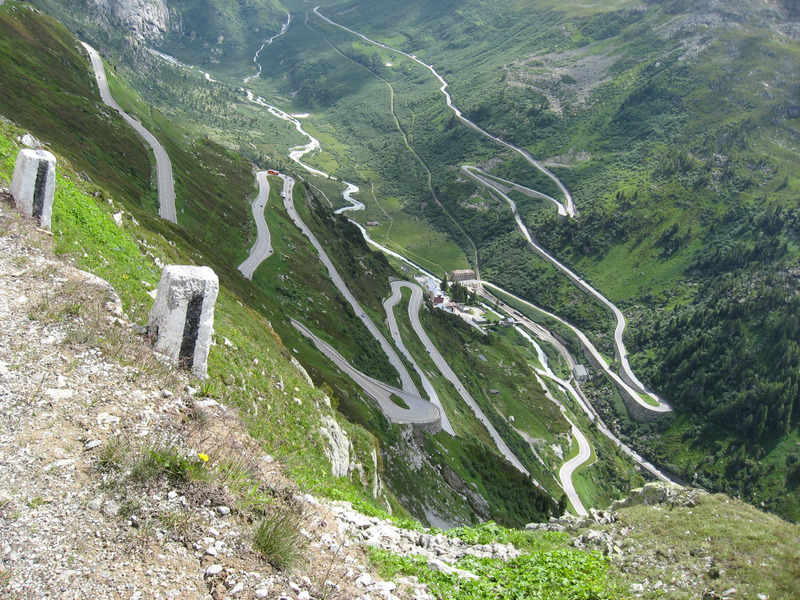 It has also acquired monikers like Grove’s Road, Coroico Road, Camino de las Yungas, Death Road, or Road of Fate (the name which I prefer the most). While a couple of those don’t sound so bad, the last two are particularly worrisome. Interestingly, the road was built in the 1930’s by Paraguayan prisoners, during the Chaco War. I wonder how many died during construction of the hazardous route. I know what you’re thinking: if the road is so dangerous, why would anyone in their right mind ever take it. Well, it is one of the only routes that will get you into the Amazon Rainforest. Personally, I think I’ll take my rainforest in the Rainforest Café style, where I can have a nice wrap, fries, and beverage in a collectible cup instead! 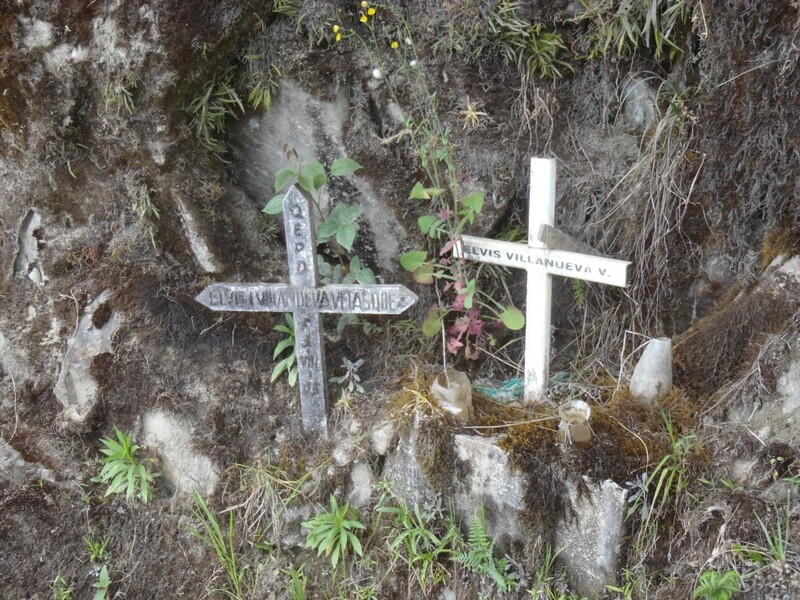 There is also a South Yungas Road, connecting La Paz to the town of Chulumani, that is said to be just as dangerous and the northern route. 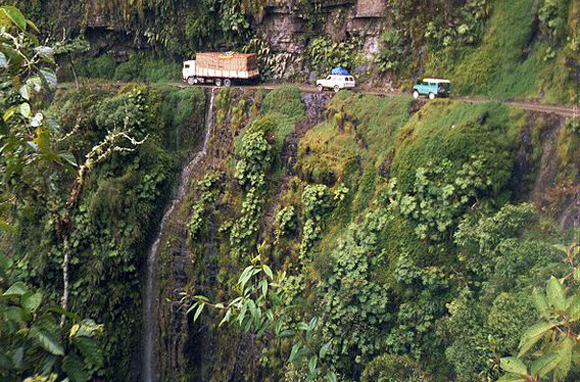 After leaving La Paz, drivers will ascend 15,000-feet, followed by a 4,000-feet descent into the town of Coroico. The road is often only one lane wide and if you expect to see many guardrails, best of luck to you. That’s one “I spy with my little eye” game that will not yield results. The road is marked with crosses in many spots where vehicles have gone off the pavement and fallen off the cliffs, so that might be a better “I spy” item. If you do go off the road, you’re looking at a potential 600-meter fall. As if things weren’t challenging enough already, during Bolivia’s rainy season, from November to March, rain and fog can severely obstruct visibility, as well as affect the road, turning it into a muddy mess and causing loss of traction. Falling rocks and dust from other vehicles can also be issues drivers have to deal with. Lastly (perhaps literally), if you get too close to the edge, the roadway may slip out from under you. Rules of the road include the downhill driver giving the right of way to the uphill drive, to ensure the faster moving downhill vehicles slow down when coming upon a car going in the other direction and driver’s having to be on the left side of the road (a contrast to the rest of the country), so they can view their outside wheels and position against the cliff when making passes. In 2006, a project to update the highway was completed. Added features included widening sections of the road to accommodate two lanes, updated paving, new bridges, drainage, and even an entirely original section between the towns of Chusquipata and Yolosa, bypassing one of the worst portions of the old road. The work took 20 years to complete and yes, they finally added some damn guardrails! While North Yungas Road has become a death trap to many motorists, thrill-seeking mountain bikers have come to love the route, which includes a massive downhill portion of about 64 kilometers. There’s even tour groups operating to suit the needs of daredevil cyclists. Since 1998, 18 cyclists (and perhaps more) have not survived the Road of Death. It has also become a popular destination for those who want to try their hand (ahem, luck) at the treacherous route. North Yungas Road has been featured in TV shows such as Top Gear, Ice Road Truckers: Deadliest Roads, and World’s Most Dangerous Roads, as well as a Mitsubishi Outlander commercial – the first to ever be filmed on the death trap. We’ll depart (bad choice of word) with this chilling fact: the single worst accident to occur happened in 1983 when a bus left the road, rolling down into a canyon below and killing over 100 passengers. While they weren’t killed by El Camino de la Muerte, this seems like as perfect a time as any to reveal that legendary outlaw duo of Butch Cassidy and the Sundance Kid died in Bolivia, following a long shootout with Bolivian soldiers. It’s believed one of the bandits shot the other to put him out of his misery after a fatal wound and then turned the gun on himself. There’s a bunch of really good recipes (particularly shots) at the Agwa site and I only wish I had more than two mini bottles of the liquor to try them all. 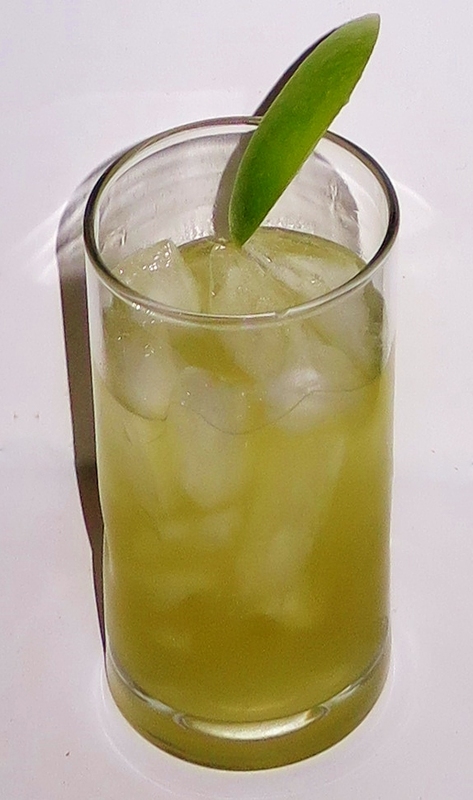 The best part about this cocktail is how nice the Apple and Lime mixes. No wonder there’s an Apple-Lime Juice, which has become one of my favourite non-soda mixers!